If coconut oil has not been your primary cooking oil then I am sure it will be after you read the incredible list of benefits you can derive just from switching your primary cooking oil to coconut oil. Truth is, not all oils are created equally. Contrary to what the commercials try to convince you of, many oils that are marketed as healthy are not. However, there are good oils you should be using. Coconut oil is one of them…it offers healthy benefits the same way olive oil does. No doubt the biggest reason to switch to coconut oil for your cooking needs is that experiments with rats show that those given healthy coconut oil were less likely to develop cancerous tumors. It seems they were able to fight off cancer cells that were intentionally injected into them. Although the study was not done on humans, it’s enough to sway most of us to play it safe and simply buy and use coconut oil in our diets. It works as an antifungal agent to fight off Candida Yeast infections. You simply drink a dose down until your condition subsides. Controls blood sugar levels. Blood sugar levels directly impact your ability to lose weight and keep it off. It also works to boost your energy level throughout the day, keeping it stable so you can stay focused and alert. Strengthens your immune system. That’s never a bad thing. A healthy immune system means a healthy you. Seems that the presence of medium chain fatty acids in coconut oil kill off viruses and bacteria that lead to a world of health issues. Increases good cholesterol: Cholesterol used to get a bad rap all around but no they’ve divided the good from the bad cholesterol and coconut oil has been shown to increase the level of good cholesterol. 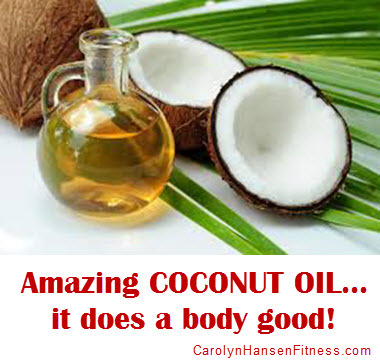 If you want the cells of your body to be in healthy shape then adding coconut oil to your diet is important. Combats osteoporosis. Once again using studies done on rats, there was a definite increase in bone volume and structure…enough to convince those conducting the research to conclude that coconut oil is an important element for the creation of stronger, denser bones. Improved cardio-vascular system: Coconut oil is a healthy fat filled with combat fighting antioxidants and helps with your cardiovascular system. This coupled with healthier skin (also provided by consuming coconut oil) and you’ve slowed down the aging clock. Abundant active medium-chain-fatty-acids are at work in coconut oil killing all sorts of germs including viruses, bacteria and fungi. Coconut oil is packed with acids that work to neutralize these germs. It’s always better to get the germs out of your body than to allow them to stay in and cause damage. Those are just a few of the benefits you’ll derive from making coconut oil your primary cooking oil. There’s really no reason not to switch. Don’t believe for a second that coconut oil will make you fat…the opposite is actually true. Coconut oil works to rev up your metabolism, detoxing the body and raising your good cholesterol levels. The end result is that you lose weight, especially that unwanted body fat. Coconut oil…it does a body good. Using coconut oil as your primary cooking oil is just one step you can proactively take in your personal war against cancer. You can avoid this monstrous threat but you need to be taking the right steps now before you have to face it head on. “Just Say NO to Cancer” is my comprehensive course covering everything you need to be doing now to avoid cancer later. Lifestyle choices, not chance determine your destiny.